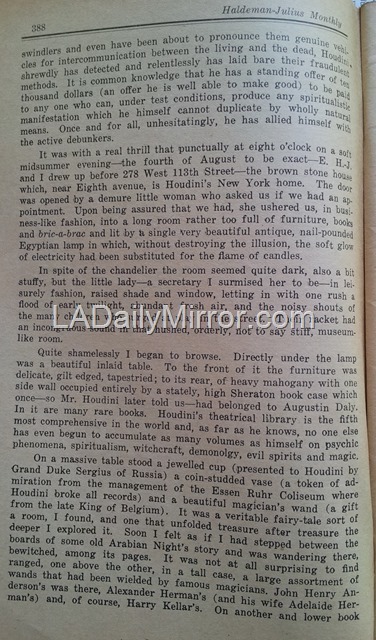 We have been collecting issues of Haldeman-Julius Monthly for several years, but one issue was particularly elusive: The October 1925 number featuring an interview with Harry Houdini, written by Marcet Haldeman-Julius, which was published a year before his death and is apparently keenly desired by collectors. The paper is old and brittle and would not stand up to a scanner, so I photographed the article (Pages 387-397) instead. The images are watermarked because of prevalent practice of swiping pictures on the Internet without attribution or acknowledgement of a source. Pinterest and Skyscraperpage.com, this means you. Haldeman-Julius Monthly was published by Emanuel Haldeman-Julius with the motto “Make the World Unsafe for Hypocrisy.” It changed names to “The Debunker” in 1928 and apparently ceased publication about 1931. 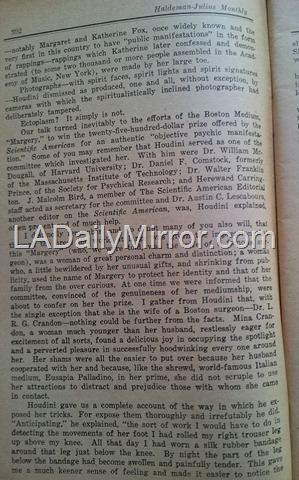 Emanuel Haldeman-Julius loved to debunk charismatic religious figures of the day and Louis Adamic wrote a series of articles for the magazine about Los Angeles evangelist Aimee Semple McPherson’s mysterious disappearance and miraculous return in 1926. 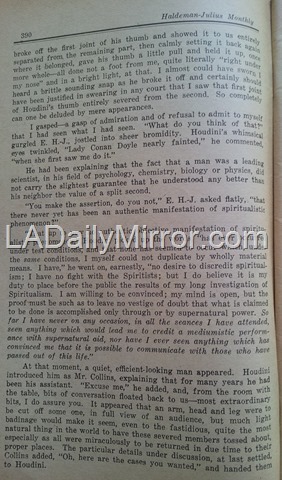 In this vein, the bulk of the Houdini interview is devoted to the charlatans of the day posing as mediums who could communicate with the dead and frequently duped grieving and gullible survivors. 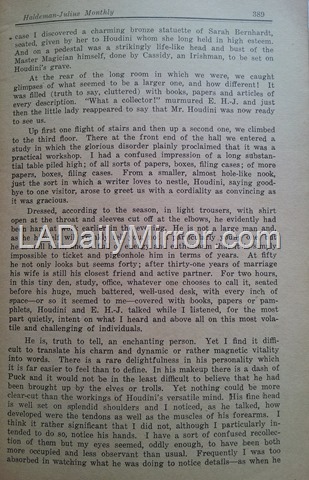 There is also a detailed of description Houdini’s New York brownstone, which was crammed with books and memorabilia, and a cameo appearance by Mrs. Houdini. Harry Houdini’s brownstone, 278 W. 113th St., New York, via Google Street View. This entry was posted in 1925, Another Good Story Ruined, From the Stacks and tagged 1925, From the Stacks, Haldeman-Julius, Harry Houdini. Bookmark the permalink. I read that Sir Arthur Conan Doyle lost a son in WW I, as millions did, and turned to spiritualism in order to contact him and for solace. Sensational. Thank you so much for posting this. Great publication! Thank you very much for sharing such an interesting interview in a little-known magazine. I have just discovered an original copy of this magazine in an extensive collection. It is in excellent condition. I knew as soon as I saw it that it was a special piece and we are glad to have it. I am looking forward to reading the article.